A long-lasting honey treat stick for Hamsters triple baked on to a wooden stick with clip holder for your pet's enjoyment. Each bag contains two treat sticks. You will receive 4 bags. Crunchy treat sticks made with whole grains, seeds, honey, and fortified vitamins for a tasty, healthy reward. 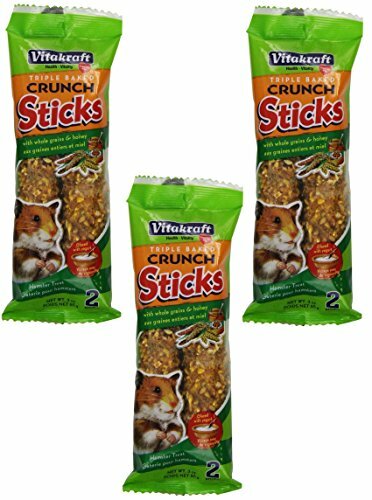 Triple Baked Crunch Sticks don't just taste good: they also promote hamsters' natural gnawing instincts to support strong, healthy teeth. 100502969 Pet Type: Hamster/Gerbil, Size: 8 Ounce Features: -Availabe in Chinchilla, Chinchilla Honey Sticks, Guinea Pig, Ham / Gerb Honey Stick and Hamster / Gerbil. -Availabe in 3 Pound, 25 Pound, 4 Ounce, 5 Pound, 10 Pound and 8 Ounce sizes. -Allergen information: manufactured in a facility that processes peanuts and other tree nuts. -Protection - rich in natural antioxidants for immune support and general health. Product Type: -Food. Small Animal Type: -Chinchilla/Guinea Pig/Hamster. Pet Category: -Small Animals. Color: -Blues & Purples. Generic Dimensions: -Chinchilla / 3 lbs Weight: 3.05 lbs. -Chinchilla / 3 lbs 9" H x 7" W x 4" D. -Chinchilla / 25 lbs Weight: 25.6 lbs. -Chinchilla / 25 lbs .5" H x 14.5" W x 25" D. Dimensions: Overall Height - Top to Bottom: -9 Inches. Overall Width - Side to Side: -8.75 Inches. Overall Depth - Front to Back: -4.75 Inches. 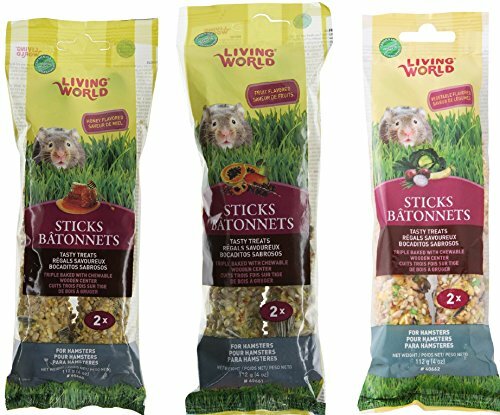 Living World Sticks for Hamsters are healthy and delicious treats that provide many outstanding benefits, including excellent nutrition, an enticing incentive to exercise and a safe way to satisfy your pet's instinctive need to nibble. The sticks contain high quality grains, seeds and honey, which are triple baked to ensure that your furry little friend gets a healthy, crunchy and irresistible treat every time. Highly palatable, the tasty sticks will entice your pet to chew away with enthusiasm, providing an excellent form of exercise and entertainment that helps relieve boredom, as well as an effective outlet for your small animal's constant need to gnaw. Each stick has a natural wood center that is completely chewable and safe. Living World Sticks also come with a flexible clip holder so that you can easily hang them on the cage wire for easy access. Living World Sticks for Guinea Pigs are healthy and delicious treats that provide many outstanding benefits, including excellent nutrition, an enticing incentive to exercise and a safe way to satisfy your pet's instinctive need to nibble. The sticks contain high quality grains, seeds and honey, which are triple baked to ensure that your furry little friend gets a healthy, crunchy and irresistible treat every time. Highly palatable, the tasty sticks will entice your pet to chew away with enthusiasm, providing an excellent form of exercise and entertainment that helps relieve boredom, as well as an effective outlet for your small animal's constant need to gnaw. Each stick has a natural wood center that is completely chewable and safe. The sticks also come with a flexible clip holder so that you can easily hang them on the cage wire for easy access. Crunchy treat sticks made with whole grains, seeds, peanuts honey, and fortified vitamins for a tasty, healthy reward. The delicious yogurt glaze on Vitakraft Triple Baked Crunch Sticks with Whole Grains & Honey offers your companion an even tastier, extra special treat! 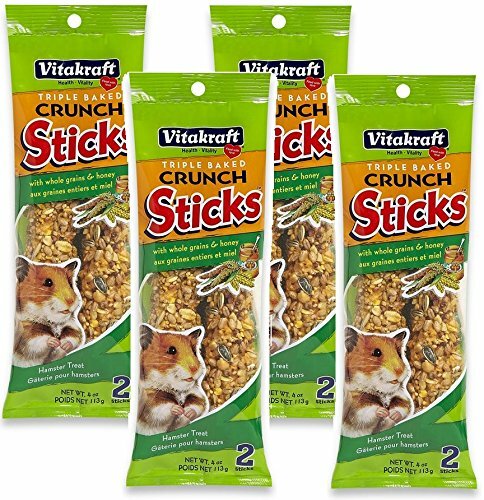 But Triple Baked Crunch Sticks don't just taste good: they also promote hamsters' natural gnawing instincts to support strong, healthy teeth. Crunchy treat sticks made with whole grains, fruit, honey, and fortified vitamins for a tasty, healthy reward. 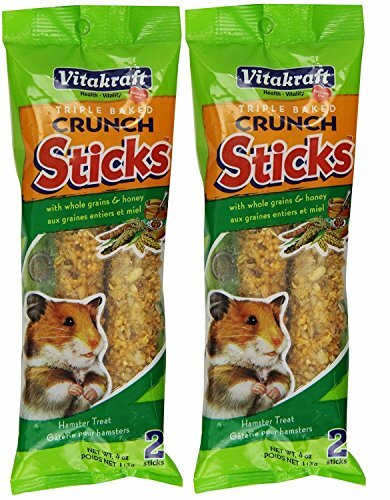 Triple Baked Crunch Sticks don't just taste good: they also promote important chewing needed to wear down guinea pigs' always-growing teeth for optimum dental health. Designed specifically for guinea pigs with extra Vitamin C.
A fun-to-eat way to add variety and activity to your pet's diet. Honey flavor is a favorite of both birds and small animals. The fresh-tasting treat sticks provide a special treat made from fortified, nutritious ingredients. Value pack treat sticks offer larger portions for your convenience. 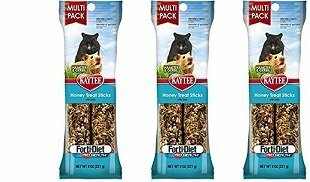 Forti-diet 8 oz Hamster/gerbil honey stick value pack Nutritious ingredients The fresh-tasting treat sticks provide a special treat made from fortified. Ingredients: Milo, sunflower, white millet, small yellow corn, wheat, safflower, wrinkled peas, toasted corn flakes, oat groats, oats, hulled sunflower, pumpkin seed, dehydrated alfalfa meal, dehulled soybean meal, ground yellow corn, gelatin, honey, sugar, ground oats, ground wheat, calcium carbonate, dicalcium phosphate, cane molasses, salt, corn oil, vitamin a supplement, dl-methionine, l-lysine, choline chloride, ferrous carbonate, manganous oxide, riboflavin supplement, ethoxyouin (a preservative), zinc oxide, vitamin b12 supplement, vitamin e supplement, niacin, copper oxide, menadione sodium bisulfite complex (source of vitamin k activity), cholecalciferol (source of vitamin d3), calcium pantothenate, pyridoxine hydrochloride, thiamine mononitrate, calcium iodate, folic acid, biotin, cobalt carbonate, sodium selenite, artificial and natural colors. Forti-diet, 8 oz. rabbit honey stick value pack. Vitamin fortified crunchy treat sticks made with tasty whole grains, seeds, carrot, and honey for a tasty, healthy reward. Triple Baked Crunch Sticks don't just taste good: they also promote important chewing needed to wear down rabbits' always-growing teeth for optimum dental health. PRI's Manuka honey sticks are great for those on the go! Take your daily dose of Manuka with you and enjoy it direct from the stick to give your immune system that extra boost during the day, put in tea or coffee, or even on your morning yogurt, granola or oatmeal! Also a great treat for kids lunch boxes! Crunchy treat sticks made with whole grains, honey, and fortified vitamins for a tasty, healthy reward. 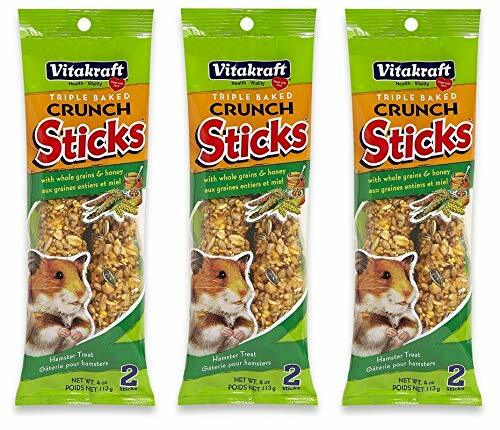 Triple Baked Crunch Sticks don't just taste good: they also promote important chewing needed to wear down guinea pigs' always-growing teeth for optimum dental health. 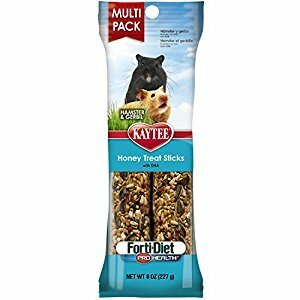 Designed specifically for guinea pigs with extra Vitamin C.
KAYTEE PET Hamster/Gerbil Treats, Honey Stick, 8-oz. HOW TO GET YOUR HAMSTER TO CHEW! Looking for more Hamster Honey Sticks similar ideas? Try to explore these searches: Garden Party Toy, Boston Red Sox Pub Table, and Cork Champagne Bottle. BlesDeal.com is the smartest way for online shopping: compare prices of leading online stores for best Hamster Honey Sticks gift ideas, Hamster Honey Sticks deals, and popular accessories. Don't miss TOP deals updated daily.